Dan is the "Visual Strategist" for NASA's Jet Propulsion Laboratory at CalTech where he develops creative ways of communicating science. He recently has done artwork with aerogel and on a team to develop a 108-foot long data driven sculpture at the San Jose airport. 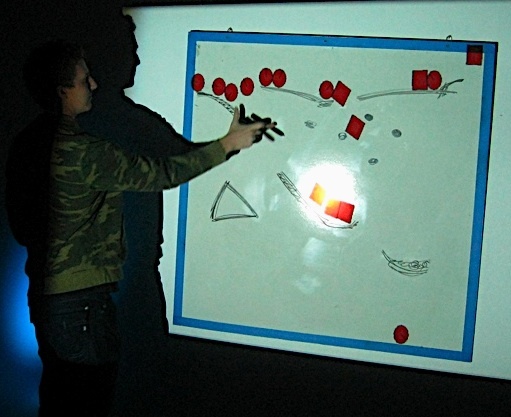 Mindshare LA Labs' Eric and Brent will present ArtFall: a dynamic physical simulation by drawing on a whiteboard. Arduino + Chumby = Fun! : The Chumby is an open-source, ambient Internet device running Linux while the Arduino is an open-source prototyping platform. Brian will show how to connect an Arduino to the Chumby and develop a simple application that monitors the environment. If you need a cheap absolute optical encoder, check out the Bourns EAW which is ~$15 from Mouser. I'm again considering my spinning head driven by the Parallax PIR sensors. The only question is whether I use a gearbox servo or build my own motor & encoder.